Curiosity surrounds an isolated grave bearing only the name “Lise.” In an abandoned, older section of the graveyard, witnesses have described wraithlike spirits, strange lights, foul odors, cold spots and a strong sense of fear. Yes My brother and I had experiences here back in the 1960’s. It was the evening about 10 PM my brother wanted to check out an old house on a hill next to the Graveyard. I was to frightened and stayed inside the car. I had the window down and could see my brother as he was walking up the side of the hill. There was a full moon that evening. As I was sitting there I could here the crickets chirping when suddenly they stopped. It became very apparent that something was nearby but as I looked around at all of the headstones just below in the grass there were green eyes staring straight up…was I drunk or high? No! ..My brother came running back to the car and I pointed the eyes out to him. So we both observed the same thing and immediately got out of that Graveyard. That was 50 years ago and has stuck with me all these years. Hey, just wanted to share my experience about Mountain Cemetary here. I’m a local who’s lived here their entire life and I can say that I’ve been up at the cemetery many times (even crawling through the water drainage pipe near the entrance with friends on Halloween before). But anyways the place is a lot creepier at night and I did get some spooky feelings as well as a little tunnel vision one night at the “Lise” grave. The picture I took was of the next night after when I got some courage to come back. I looked up the grave online and it belongs to Jocke Lise who died in 1939 I believe it was. Anyways cool place to be and im not sure how paranormal it really is buy it’s definetly a cool spot. 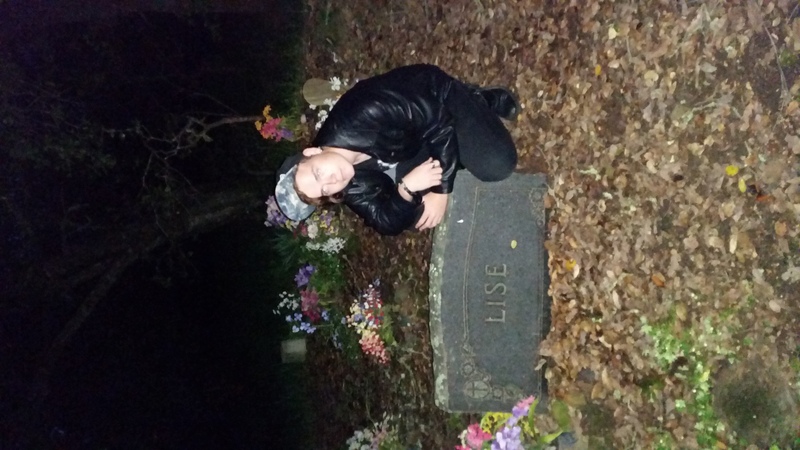 My dad and I happened to be in Sonoma recently and we decided to go to the graveyard because I know its one of the oldest cemeteries in Sonoma county and I have heard stories in the past about it and also about the lise grave. I like visiting places like this. So we drove around it and finally as we were leaving I saw the lise grave and decided to drive up next to it. Its definitely an interesting spot to be in. I felt this uneasy pressure on my head and felt that my eyesight was failing me. I also constantly felt the need to stare at it with a feeling of dread. When we decided to leave we turned around to go back up the road where the lise grave is because the end was blacked off. As we were coming back up the road before we got to the lise grave this weird solid black shadow ran across the road and you couldn’t see through it . By the way this was around 2 o’clock during the day. I thought it was just me who saw maybe because the fact that i got little sleep the night before but my dad also saw it to. We both wondered what it was but we came to the conclusion that it was not a normal shadowed casted by the trees or an animal but definitely something else. I drove out of the swiftly after that. I was taking a sunset hike through the cemetery, I am local born and raised have gone many times in day and sometimes at night. My partner and I were walking back to the car the sun set it was dark. As we were reaching the exit we saw a black shadow like figure as if it was walking up hill towards the white cross we stood for a moment and watched as it seemed to walk behind a bush then disappear we ran out of there fast.